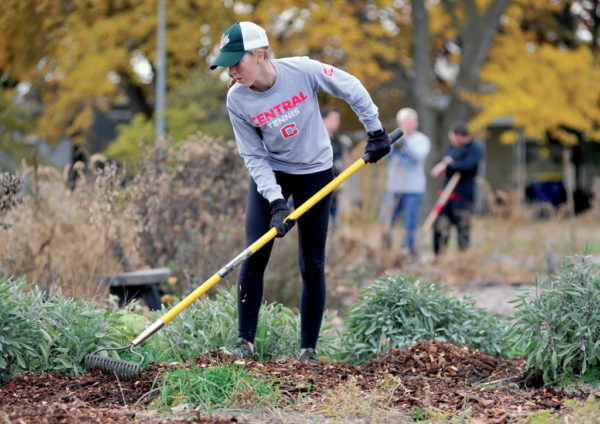 For the first time in 12 years, Central’s service day took place in October instead of the spring. In this annual tradition since 2006, the college cancels classes, and students, faculty and staff serve Pella and central Iowa. “Community partners needed help with fall projects [such as raking leaves, above],” explains Cheri Trout Doane ’98, Central’s director of community-based learning. Teaching English-learning students in Des Moines to play steel pans. Improving woodlands at Christie Park in Pleasant Hill. Doing outdoor work at Pella Regional Health Center. Supporting clients at the Pella Food Shelf. Collecting oral histories of Upward Bound participants in Des Moines. To learn more about service learning at Central, visit central.edu/service.